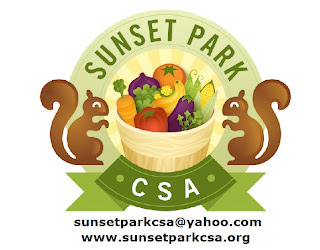 While some of the more established CSAs around town have been sold out for a while, the brand new Sunset Park CSA has some unattached shares. They have regular shares and low-income shares available. The farm, MimoMex in Goshen, has been working with Green Markets and CSAs for several years. They grow many of the more typical vegetables, but their specialty is Mexican produce; they are well known for their beautiful squash blossoms. If you went to the Sunset Green Market last year, you probably saw them. One of the links below includes a recipe for squash blossoms. So, if you're looking to get fresh produce right off the farm this season, don't wait! Write to the Sunset Park CSA for more information. And isn't their logo fantastic? Check out JoFolio's link on the right to see more of his work. If you need more information, email sunsetparkcsa@yahoo.com and we will send you a PDF of our Information/FAQ and a membership form. These contain the share price and other info about the CSA. And here's a New York Times Article from 2007. Very exciting to see a CSA in the 'hood. Maybe decent coffee isn't too far off. Btw, how do I get in touch with Mrs. or Mr. Best View in Brooklyn? Nancy, you can email bestviewinbrooklyn@yahoo.com.